When the detritus of day-to-day life gets to be too much for your home, it is easy to toss everything into the garage. Unfortunately, most garages are not set up for proper storage of your things. Most people end up with piles so deep and high that they can’t find the tools they need in a reasonable amount of time. In many cases, that means extra expense to purchase new equipment, which eventually ends up lost in the piles, too. 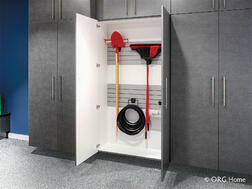 Innovative storage solutions like Boston Garage Cabinets make organizing your garage easy. These solutions maximize your space so that everything fits while keeping it displayed in such a way that you can find everything in a few short moments. At one time, the choices for garage cabinets were extremely limited. Just about anything available for a reasonable price was an eyesore. Today’s options are newly designed to provide high-quality storage solutions that are both attractive and affordable. Solid construction ensures they can withstand the wear-and-tear that is normal in a garage setting while still offering easy-to-clean surfaces. 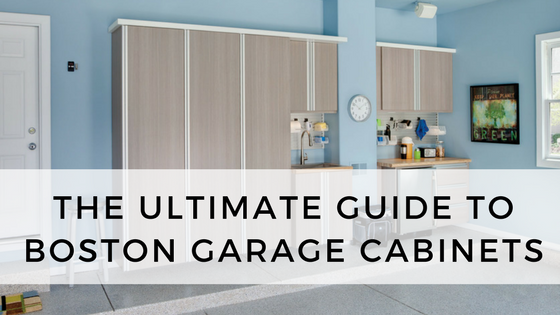 Examples of the most popular cabinets include ORG's Signature Garage Cabinets. The Signature series is available in a variety of colors, such as Chateau, Copper Blaze, Driftwood, Heritage Maple, Platinum and Arctic White. Cabinets can be customized to fit your space, with dimensions expanding up to 48 inches wide. Because they have a fully integrated back and are mounted on the wall, these fixtures are easy to clean. This is an important feature when it comes to keeping pests out. Shelves are an inch thick, so they can hold even the heaviest items, and the height can be adjusted to fit your needs. Many homeowners choose from this series because they appreciate the sophisticated appearance of the sleek European styling. In fact, after adding Signature cabinets, some families decide their garage should be more than just a storage area and they make use of the room as additional living space. ORG's Executive Garage Cabinets are popular for the classic feel they inspire, combining advanced cabinet engineering with a more traditional look. A wide selection of size options maximizes utilization of space, and Executive Cabinets are completely customizable. Interior and exterior colors match, and there are more than 22 shades to choose from. The Executive line is designed to fit every space, so cabinet legs are adjustable in case of uneven flooring. Shelves are 3/4” thick, and they can also be adjusted, ensuring that organizing is quick and easy. When planning your garage storage strategy, keep these key features of Boston garage cabinets in mind. Components are designed to keep your possessions off of the floor, protecting them from the damage that moisture and pests can inflict. Quarter-inch backed cabinets add an extra layer of protection, and these feature top-grade European concealed hinges. 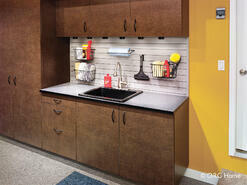 Staples are only used for paper at Boston Garage – never for cabinets. Boston Garage relies on all-steel construction hardware in every project. In addition, cabinets use “Dado Joint” joint construction, complete with PVC edge banding, and handles are either cast or stainless steel. All cabinets are precision built using thermal-fused melamine – a material that can survive heavy loads and a range of extreme temperatures. Melamine shelving is easy to clean, so you don’t have to worry about spills. The adjustable shelves are an inch thick, which is 25 percent more than the industry standard. As a result, the shelves in Boston Garage cabinets enjoy a load-bearing capacity of up to 100 pounds without warping or sagging. While most cabinets are unsuitable for large or bulky items, Boston Garage ensures that all of your things have a place, because no center posts are used. Instead, cabinets have full-width openings. All cabinet systems can be customized to fit the individual needs of your space. Once your cabinets are installed, you can further tailor your storage system to your exact specifications. Options range from adjustable shelving and hanging rods to hooks mounted on a slat wall. This gives you even more storage space, as well as visibility and access to every item. At first glance, bringing organization to cluttered garages can seem hopeless. Sorting through piles of old things might feel like a never-ending task. 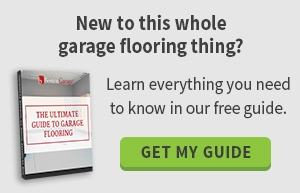 However, advances in storage solutions make the process easier, and more important – once you have successfully organized your garage, it will stay that way for good. This Five-Day Garage Organization Plan can help you get started, and when this project is complete, you can look forward to a more pleasant, enjoyable space. More importantly, you will be able to see and use the tools and equipment stored in your garage, saving you time and money when it comes to completing home projects. Don’t settle for low-quality, unattractive shelving and bins from a discount store. These do nothing to protect your possessions, and they simply transfer the disorganized piles from the floor to a shelf. You will continue to struggle with finding things you would like to use, and the likelihood that items will be in good working order when you do find them is slim. Instead, design your garage cabinets to fit the organizational needs in your Boston home. Contact us to learn more today!